A new Senran Kagura-like action game for PS Vita. Famitsu this week reveals Bokosuka Girls: Tatsunoko Gakuen Climax, a new cute girls action game from Tatsunoko Production for PS Vita. By wearing the suits of Tatsunoko heroes, the game’s heroines are granted their powers, resulting in strip battles. It features cut-in scenes, such as when a character’s clothes are torn, and melee, shooting, and assault-based fighting. There are mini-games in which you touch the girls while they sleep, as well. 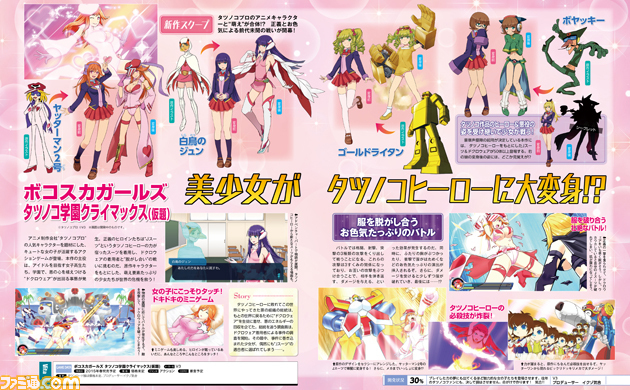 Over 50 characters are set to appear, including Yatterman 2, Jun the Swan, Gold Lightan, and Boyakki. The game is 30 percent complete and is due out in Japan in spring 2015.